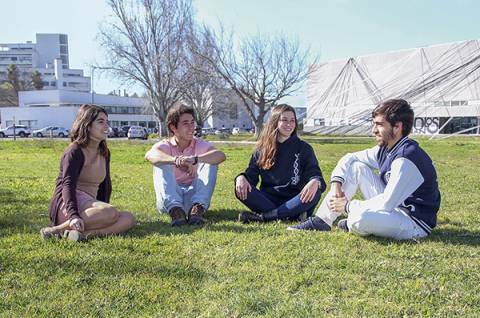 The schools from NOVA University Lisbon will open their doors to the public and show their facilities and academic offer in several Open Day actions. Expo FCT is already in its 13th edition with the purpose of facilitating pre-university youngsters in their choice for a degree through several demonstrations and activities in the area of Science and Engineering, involving all the school's departments in its several technological and scientific aspects. High school students and also Professors, parents and family are invited to join thie event in which more than 150 scientific experiments and demonstrations will be presented. They will also have the opportunity to participate in radical and cultural activities. Check more information on the website of Expo FCT. FCSH NOVA promotes another edition of NOVA Day & Night. During the day, applicants are invited to attend presentations from each of the 14 bachelor degrees offered at NOVA FCSH, to participate in activities organized by students, to watch demonstrations from sports' teams and much more. The event continues during the evening starting with a barbacue followed by concerts. More information available soon on the faculty website. Students who are interested in pursuing a degree in Economics or Management are invited to visit Nova SBE on March 29 and April 22. During these days applicants will get to know the two areas of study of the school, listen to testemonies from current students, meet the Career's Office and watch presentations from the school's clubs. Check further information at the website of Nova SBE. NOVA Medical School | Faculdade de Ciências Médicas (NMS|FCM) invites all interested applicants to visit their facilities in Campo Mártires da Pátria on May 8. Applicants will get to know the academic offer of the school which, besides the Integrated Master in Medicine, it also includes the Bachelor in Nutrition Scinces. NOVA Law School organizes two Open Days, one on March 20, meant for applicants to one of the seven Masters offered, and another one on May 3, for those who wish to apply to the Bachelor in Law. During those days it will be possible to clarify all questions and also to hear testimonies from current students of the school. Registration for the Open Day for Undergraduate Courses available here. Registration for the Open Day of Masters available here. Instituto de Higiene e Medicina Tropical invites all community to get to know Tropical Medicine in two days full of activities. Activities include watching the extraction and visualization of DNA, observing cells, simulating a traveller's medical appointment and dietary advice. More than showing the academic offer, IHMT's Open Day is an opportunity to get to know the research taking place at the Institute as well as to discover the history of Tropical Medicine in Portugal. Further information available on the website of IHMT. Information regarding Open Day activities from other NOVA schools will be available soon.